NANCY CATHERINE NORTHCUTT was born 09 Feb 1863 in Monarch, Marion County, Arkansas, and died 28 Mar 1957. She was the daughter of JOEL BAKER NORTHCUTT and MANERVA JANE HUDSON. She married (1) W. BERT NALLEY 26 Dec 1880. 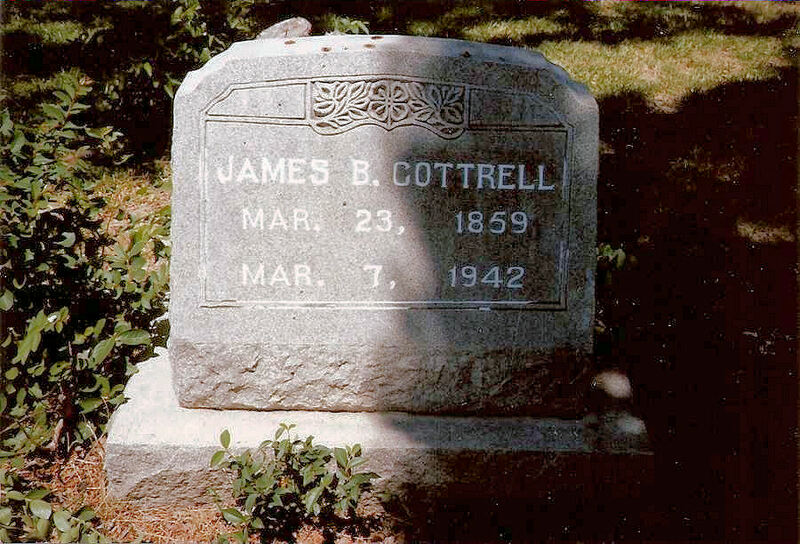 He was born 17 May 1860 and died in 1888 in Comanche County, TX.. She married (2) JAMES BUCHANAN COTTRELL 1896. He was born Mar 23, 1859 and died Mar 7, 1942 in Brady, McCulloch County, TX. He first married Rachel Ann Cooper..
BERTHA NALLEY b. 27 Jul 1882, Station, McClennon County, TX. 2. BERTHA6 NALLEY (NANCY CATHERINE5 NORTHCUTT, JOEL BAKER4, WILLIAM3, WILLIAM2, HOSEA1) was born 27 Jul 1882 in Station, McClennon County, TX. She married JAMES TATUM GRESSETT Abt. 1899 in Texas. He was born 16 May 1877 in Texas, and died 04 Feb 1941.
i. JAMES H.7 GRESSETT, b. 12 Dec 1902, Texas; d. 02 Jul 1997, Hood County, TX. ii. FLOYD KIRBY GRESSETT, b. 05 May 1903, Texas; d. 16 Mar 1995, Ventura, California. iii. BERGE ELGER GRESSETT, b. 24 Jun 1905, McCulloch County, TX; d. 18 Nov 1985, McCulloch County, TX; m. MAUDINE ANDERSON; b. 06 Aug 1910, Texas; d. 06 Jun 1984, McCulloch County, TX. iv. RACHEL INEZ GRESSETT, b. Abt. 1908, Texas. v. GUY GRESSETT, b. 31 Aug 1912, McCulloch County, TX; d. Sep 1912, McCulloch County, TX. vi. MANERVA FAY GRESSETT, b. Abt. 1913, Texas. vii. JESS WILLARD GRESSETT, b. 06 May 1915, Texas; d. 12 Oct 1999, Santa Fe, Santa Fe County, New Mexico. viii. PAULINE ESTRELL GRESSETT, b. 1919, Texas. ix. FRANK HARVEY GRESSETT, b. Abt. 1921, Texas. 3. JAMES MONROE6 COTTRELL (NANCY CATHERINE5 NORTHCUTT, JOEL BAKER4, WILLIAM3, WILLIAM2, HOSEA1) was born 28 Nov 1888 in Comanche County, TX, and died Jul 1978 in Ryan, Jefferson County, TX. He married MAUDIE MYRTLE BARTRAM. She was born 13 Jan 1897 in Oklahoma, and died 15 Jul 1988 in Jefferson County, OK.
i. LESTER7 COTTRELL, b. Abt. 1915, Oklahoma. ii. CHESTER COTTRELL, b. Abt. 1915, Oklahoma. Comanche – After a long battle with illness, JAMES MONROE COTTRELL JR., 77, of Comanche, went to be with the Lord on Monday, April 9, 2007, at Duncan Regional Hospital. Funeral will be at 10 a.m. Monday, in Comanche Funeral Home Chapel with Daryle Schmitt, pastor, officiating. Burial will be in Fairlawn Cemetery. James was born March 7, 1930, in Terral, to James and Maudie Bartram Cottrell. He grew up in Jefferson County, attending schools at Terral, Ringling, and graduating from high school in Claypool. He married Wanda Lee Heidelberg on Jan. 13, 1951, in Waurika. They lived southeast of Waurika, and have made their home in the Meridian area for the last 55 years. James worked for Sun and Tosco Refinery for 32 years until retiring in 1983. He also farmed and ranched east of Comanche until his death. Survivors include his wife, Wanda of Comanche; two sons, David Cottrell of Garland, Texas, and Mike Cottrell and his wife Nancy of Choctaw; three grandchildren, Jameson Cottrell and his wife Jamie of Oklahoma City, Nathan Cottrell and his wife Nicole of Laredo, Texas, and Baron Cottrell of Buckholts, Texas; four great-grandchildren, Brooke and Micah Cottrell of Laredo, and Autumn and Carson Cottrell of Oklahoma City; three brothers, Chester Cottrell of Oklahoma City, Sam Cottrell of Durant, and Jack Cottrell of Santa Fe, N.M.; and two sisters, Mary Lois Horn of Oklahoma City, and Pansy Antrim of Waurika. He was preceded in death by his parents; two brothers, Lester and J.B. Cottrell; and a sister, Irene Hill. He was a loving and caring husband, father, grandfather and friend. He will be dearly missed.